Bloody hell this is old huh, I was a young fella that got done over on this comp, I didnt qualify to skate in it because I sucked, then I missed out on getting a media pass so I ended up shooting from the bottom with a few buddies from Adelaide. I think we smuggled some beers in and had a great time. 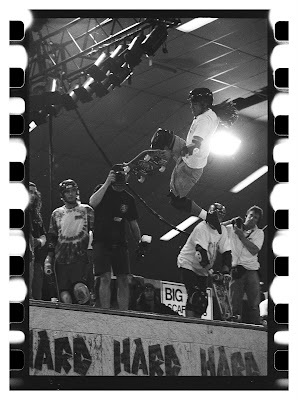 So on the platform is : Jeff Phillips, David Walsh, Peanut Brown, Tony Hallam and Kevin Thatcher from Thrasher magazine. Radness.